The best Way to replace a few teeth that are arranged as a span or group is with a dental implant supported bridge. Implant Bridges can be done with 2-6 tooth Implants. Implant teeth bridges can replace 3 teeth up to a full arch of teeth permanently. For the case of this page we are not discussing full mouth implant bridges such as All on 4. Dr Adams sees patients from Maryland, DC, Virginia, across the USA and abroad. Dr. Adams has successfully placed thousands of implants and is a consultant, instructor and speaker for the implant company Zeramex. Zeramex is the leading manufacturer of zirconia implants in the world and is based out of Switzerland. Dr. Adams can handle cases involving one up to a full mouth of implants. Dr. Adams performs his own implant surgery and fits and places all his own implant teeth. As in the picture, it is best for the implant expert to place two implants on either side of the missing 3 tooth space. The implants can alternatively be place next to one another but, this leaves one side of the implant bridge unsupported. A bridge with an unsupported area is called a cantilever. It is sometimes an option to place 3 implants and do 3 individual implant supported crowns. This option will be more expensive, but will also seem more natural and be easier to clean. Cantilever implant bridges are acceptable, so long as the unsupported length is less than 1/2 the overall length of the supported part of the implant prosthetic. Once both implants have healed / osseointegrated, the implant dentist can have the bridge teeth and abutments made to complete the case. 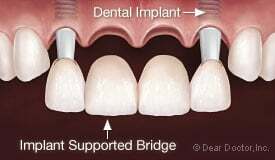 Bridges cost less than individual implants since it requires fewer implants. The tooth implant doctor should also consider what bridge will produce the best cosmetic result. Cantilever may be necessary when there is not enough room to physically place multiple implant roots. There needs to be at least 1mm of bone in between implant roots. It is better to do individual implants and individual crowns. Proper root structure preserves gum and bone. Individual teeth look more natural and are easier to clean as well. A cantilever bridge costs less money and many people may opt for the bridge since it requires fewer implants. 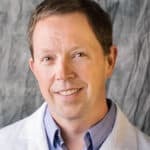 New platelet rich fibrin prf dental stem cell techniques help with gum and bone healing around implants. 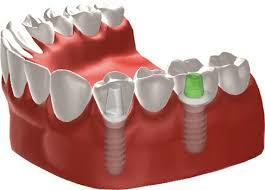 The implant in the case of a cantilever bridge should be placed into the area allowing the larger implant. Usually it is the site where the larger tooth used to be. Cosmetic considerations need to be considered as well. One implant site may lead to a more attractive result than the other. The tooth implant expert first places one implant root into the gum and bone. After the healing period, a single custom about and a 2 tooth cantilever implant bridge is placed to replace both teeth. What about replacing my front 4 teeth with implants? A picture is worth a thousand words. Two implants, followed by a healing period, 2 abutments and a 4 tooth implant bridge. Zirconia implants often called the cosmetic dental implant is ideal for teeth in the front of the mouth because they are tooth colored and metal free. What about a full mouth of implants? With the placement of 4-6 implants a full upper of lower set of teeth can be replaced. This is where it gets very expensive and complicated. See Full mouth of Dental Implants. 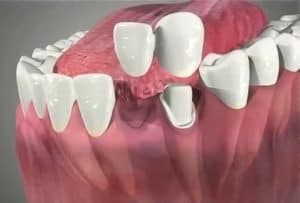 Teeth Implant Bridges are permanently installed in the mouth and are a more acceptable option for most people over removable Dentures with Implants. The most popular implant bridges are 3 and 4 teeth bridges that contain 2 Dental Implants and support spans of 3 or 4 implant teeth. Dental Implant Bridges look like teeth, function like teeth and typically last a lifetime. Implant bridges do not get cavities, need root canals or get decay. Since implants do not decay, implant bridges have a huge advantage over natural tooth bridges since bridged teeth are more difficult to clean than individual teeth and they often fail due to cavities and decay. For more information read dental implant vs bridge.